Let me tell you some stories relating to the April 21, 1836 San Jacinto Battle and my family. My Great-Great-Great-Grandfather, Capt. J. Stephen Townsend had been made a Captain by Stephen F. Austin previously to form a Ranging Company that patrolled the frontier from the Cummins Creek Area (Round Top). Col. Burleson ordered him to disband his Ranging Company but to bring them to the Plains of San Jacinto to join in the Battle for Texas Independence against a murdering dictator, Santa Anna. Of the 15-18 men who accompanied him, as many as 11 were family members. He had brought with him to settle in Texas, 4 brothers with families, and his in-laws. When they first arrived at the Texian Camp and reported in, my Grandmother’s younger brother Joel Walter Robison and stayed at the Camp, while my Grandfather took the rest of the Townsends to Harrisburg to help guard the wounded and sick and the Baggage, plus to form a Rear Guard in case of another Mexican army that might be nearby.trying to surprise the Texian Army from behind. While waiting, Stephen and his younger brother Spencer Burton Townsend came back to the Texian Camp, in time for the Gen. Houston’s decision to begin the battle about 4:30 in the afternoon. All was over with the actual attack in 18 minutes, the Mexican Army of Santa Anna was on the run for their lives. Later when the firing finally stopped, about 630 Mexican Soldados lay dead, only 9 Texians were killed or gravely wounded and died later that night from their wounds. But what was important was Santa Anna and Gen. Cos among other officers and more, were missing, they had sneaked around and run off. Gen. Houston demanded that patrols be sent out under the command of Col, now General Burleson, with orders not to kill any more Mexican soldiers and to find Santa Anna and Cos.
April 22nd, a large group of Texians left with Gen. Burleson and they were scouting around looking for the missing participants when Gen. Burleson decided to split his group up into smaller patrols to cover more area faster. A group split off that was made up of Joel Robison, and several others, led by Sgt. James Sylvester, who had been the flag bearer of the Sherman Flag the day before in the battle. They were about 9 miles away from the Texian Camp when Sylvester saw movement over near the Bayou in the tall grasses and he rode his horse in to see what might have caused the movement, a Deer or something else. He came upon a Mexican soldier dressed like a Calvary Corporal. Sylvester did not speak any Spanish and the new prisoner did not speak any English. He forced the man out to the trail where the rest of his small group was waiting. The orders were to bring anyone they found back to camp, so they began forcing the soldier to walk back to the Texian Camp, 9 miles away. They soon began a discussion about the length of time away from the search, then after dropping off the prisoner with the Camp Guards, they would have to ride back and resume their search but a lot of time would be wasted in this extra detour, so they began talking about shooting the soldier. Joel spoke a little Spanish and began talk and interpreting for the others with the prisoner. They finally decided to kill him when Joel rode his horse up and stopped between the Texians, their muskets and the prisoner, reached over and hauled him up onto his horse and rode double with him back to the camp. The prisoner asked about was Gen. Houston at the battle the day before, were they going to hang him or shoot him and the other prisoners. Uncle Joel told him the Texians and Gen. Houston did not kill prisoners, unlike Gen. Santa Anna. He never got a name out of the prisoner but he saw that this corporal was wearing a silk undershirt under his tunic and figured that whomever he said he was or what he was, h was not telling the truth. As they rode closer to the Texian Camp and came in eyesight of the other captured Mexican Prisoners under guard, they all began jumping up and hollering our “El Presidente” as they saw Joel and his prisoner approach. When that began, Joel realized who was on the back of his horse and he became frightened. Knowing the excitement level of the Texian Army and the accuracy of their muskets, he was afraid one or more of the Texian Army might try and shoot Santa Anna off the horse and hit him by mistake, so he spurred his horse and rode beyond the prisoner area and straight to where Gen. Houston lay wounded under the oak tree over by the Bayou and turned over his captive to the others there. 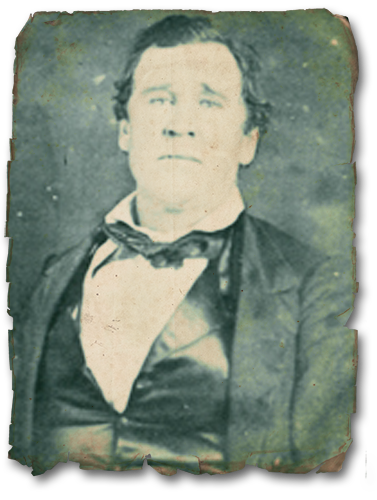 Sam Houston talked with Santa Anna after verifying he was who thought he was and Santa Anna traded Texas, ordered his armies still scattered around Texas to leave and return to Mexico, for his life. Santa Anna then asked where was the person who had brought him into camp saving his life from the others. The Texians searched around and found Joel and brought him up to Gen. Sam and Santa Anna. Santa Anna had been holding a small bundle under his arm covered in a bandana. He thanked Joel for treating him well and saving his life from the others wanting to kill him and said “this bundle is all I own to my name right now” and presented it to Joel. Joel took it back to camp and opened it up and it was a Red Vest with gold brocade across the front and 10 gold buttons, 5 on each side of the chest. Joel took it home to the Cummins Creek area and it was a farming community, no one had any money for fancy clothing, neither did the Robisons. Joel decided to offer it to young residents of their community who were getting married and let the groom wear the fancy vest for the ceremony then took it back after each one. After a few years, buttons began missing then the family let someone else borrow it for a wedding and he never brought it back. We figure those gold buttons started several families off on their new lives together.